2019 promises to be a big year for Jack Miller. Having a season at Ducati under his belt, the Australian will attack the new season aboard a GP19, a similar spec to the factory riders. Furthermore, the 23-year old knows that a place in the factory team is up for grabs in 2020, should his performances merit it. Crash.net caught up with Miller toward the end of the 2018 season to assess his time with the Italian factory to date, working over the winter, shrugging off hefty falls like the one suffered at Le Mans in 2017, and his aim of competing in a factory team for 2020. How would you assess 2018, your first season with Ducati? I think it was a good season. It was always going to be full of ups and downs, especially when you move teams, move manufacturers. But I think the good has outweighed the bad. I think we’re getting closer and closer to the goal which we set out at the start of the year, but we haven’t been able to reach it just yet. What was missing to reach that goal? A little bit here and there. If I knew, I’d fix it! It’s so hard at the minute. The championship is so, so strong. The grid’s stacked with talent and guys on good bikes. It’s not only one bike working well; we’ve seen that every manufacturer can be there on different weekends. It’s a hard one. Do you have to occasionally remind yourself that you’re still fairly young and inexperienced compared to most of your competitors? Yeah, definitely. Definitely. If you look at Cal [Crutchlow] and Dovi [Andrea Dovizioso], or even Valentino [Rossi], I’ve got a long way ahead of me. But there are a lot of young guys coming into the championship now, or guys my age that are just as hungry as you are. So you’ve got to watch your back and make sure you’re doing the right things, trying to get the best out of yourself, week-in-week-out. It can be just like that [clicks fingers], it’s so cutthroat this business. You’ve got to be ready. Was it a boost to hear Alvaro Bautista’s comments after the Australian Grand Prix, when he said the differences between the GP17 and GP18 were major, to hear how rapidly Ducati is developing? Definitely. Especially leading the race, and then sitting behind Alvaro and Andrea for most of the race I was just watching it. It looks good. The future looks bright. I’m really looking forward to [competing with] the GP19. How is your feeling at Ducati? 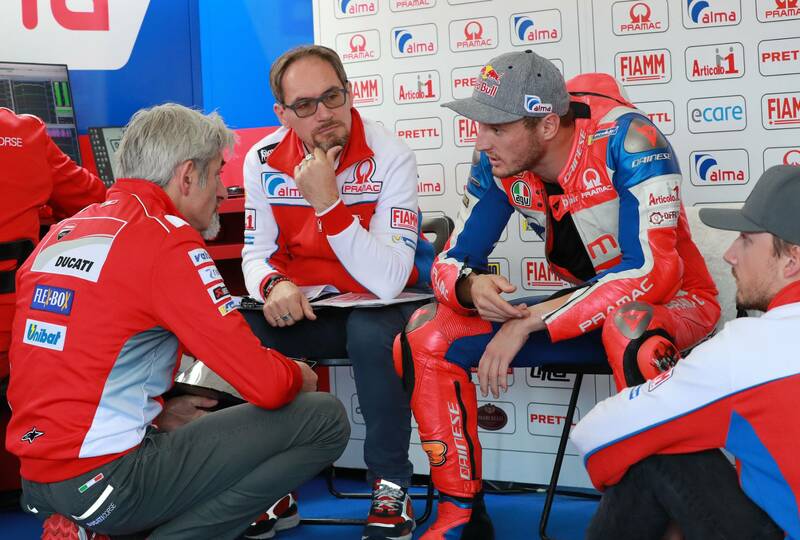 At the beginning of the season we saw instances where Gigi Dall’Igna was speaking to you in the Pramac garage. This maybe wasn’t apparent with Honda bosses during your time there. He’s still there. He does the rounds after every session. He goes to visit both of his [factory] riders first and then he comes into Petrux [Danilo Petrucci] and me. It’s always nice to give your feedback and he’s always writing into his computer what you’re saying to him. You feel as though you’re firmly part of the bigger Ducati picture? Definitely. They’re interested and they’ve really been watching me for a long time and they’ve got a lot of time for me. I definitely feel at home here. Was that a missing factor when you were riding for Honda? We just simply weren’t getting the package that we needed. It was simple as that. We were the customer. But we weren’t the customer that was first in line. We were the second. We were getting the hand-me-down hand-me-downs. I had such a great team from Honda, and such a great crew around me. There was [Cristian] Gabarrini or Ramon [Aurin] last year, which I really enjoyed so much. I can’t say anything negative in that respect. Just in terms of material, we seemed to be missing a little bit. Do you feel your achievements were a little underappreciated with the Honda? You had to change crew chiefs and seemed to be down the pecking order when it came to upgrades.